What you see in the picture is my station. The equipment is unattended, and receives and stores sonograms. This is a fundamental step in the monitoring system evolution. Even if you have time to monitor the band one hour a day, all events occurring in the remaining 23 hours are lost. Some natural radio signals may appear once per day or per month, lasting only few seconds. Even with good aerials and quiet locations the chance of receiving those signals is very little without continuous monitoring. Unattended operations with a PC is easy and inexpensive. You only need some freeware program available on Internet. 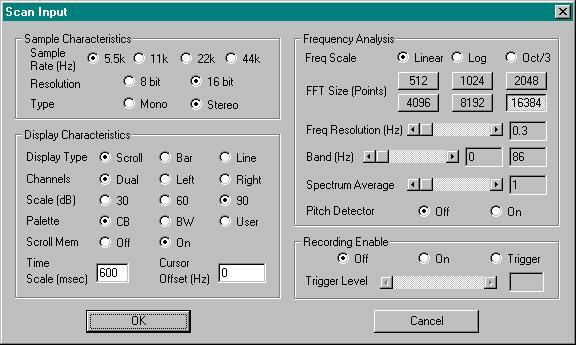 The automatic monitoring may also be used for other frequency bands, not necessarily under 22 kHz. Main purpose of the automatic operation is to save spectrograms. Saving the original signal in .WAV format is the most complete possibility but your hard disk will be filled in a day, even at a slow sampling rate (about 1 GB per day at 5.5 ks/s 16 bit in mono, 2 GB for stereo…). Then it will take long time to analyze acquired data. To store spectrograms is more practical and saves space; spectrograms are then easy to review. 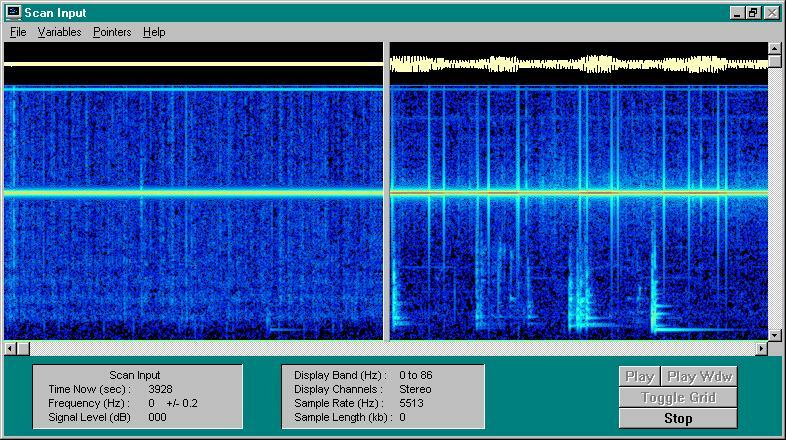 To acquire data I use Spectrogram in ‘scan-input’ function. The following example shows my program settings to monitor 0-86 Hz band. Two antennas are connected to the SoundBlaster L and R channels, to simultaneously compare signals from different reception systems. On my PC Spectrogram completes a screen in 275” with this setting. 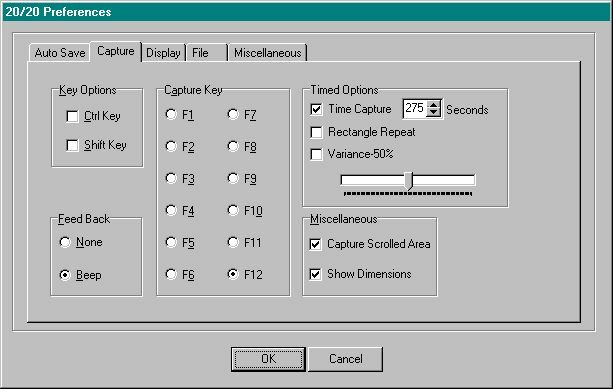 To automatically save screenshots I use 20/20, a feeeware screen capture program available. 20/20 runs correctly under Win95, saves in different graphic formats and has a timer function. 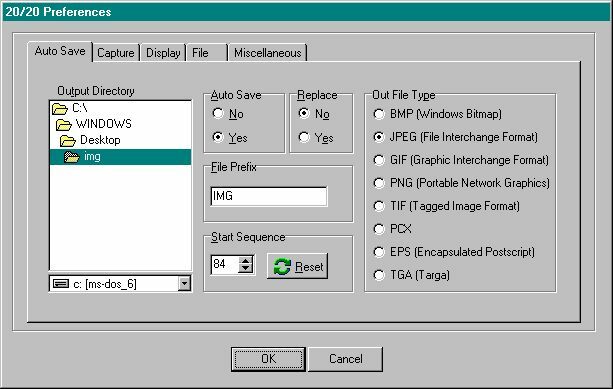 To configure the autosave function you must indicate the folder where to save files and the graphic format. I prefer JPG because of the limited file size produced, even if some details will be lost (not many). Then you must set the capture time. It must be equal or slighly lower to the screen filling time of Spectrogram with your setting. You may set a shorter time to have some overlap at the image edges. Now you may start acquisition clicking on icon of 20/20 and minimize it (click on ). 20/20 captures the current active window (Spectrogram). Of course, automatic execution programs like antivirus or ScanDisk must be disabled, and so any screen savers. Every 275” a screen shot will be taken and stored as a 100 kB .JPG file. Every day about 320 spectrograms are saved, occupying no more than 35 MB. 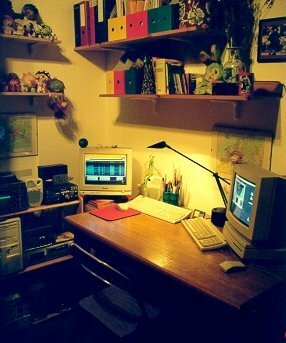 Every day or so I look quickly to the saved pictures with an image browser like ACDSee32 (shareware, see http://www.acdsystems.com). Only 1 or 2 percent of all pictures contain something new or interesting and are then saved. In this way you will quickly build an archive, composed by selections from thousands of spectrograms, and you will be able to document all phaenomena receivable with your system. The most important fact is: you will be able to compare results with other monitors. Many signals may be of local (human) origin; comparisons are extremely important.